Verhaltenswissenschaftlich fundierte Interventionsstrategien im Kontext der Energiewende. 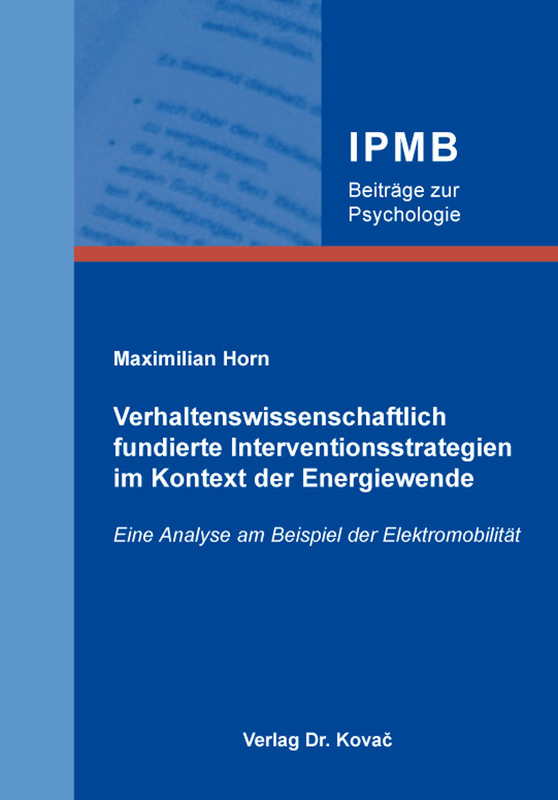 Dissertation (english) von Maximilian Horn, Verlag Dr. Kovač 2018, 370 S.
Interventions for changing individual behavior show relevance for many societal problems. Despite this importance, established approaches of intervention strategies still have considerable drawbacks: While attitude oriented research struggles with the attitude-behavior-gap, rational-choice-theory comes to its limits when explaining behavior outside rational information processes. This thesis introduces an alternative perspective to those classical theories, based on a behavior modeling approach. The procedure is exemplified through the behavior analysis of purchase and use behavior of an electric car. In this context, a novel approach for categorizing individuals by means of central mechanism of behavior control is presented. Thus follows the hypothesis that individual differences in behavior and weighing of consequences depend on experienced contingencies regarding electromobility. To revise this hypothesis, survey data has been used. One part of this data stems from more than 30 project households, in which two different electric cars have been driven over a five-year period. The other part comes from a comparison sample constituted by households, in which no electric car has been owned. Results show that participants with driving experience name more benefits of electric cars and would pay a higher purchasing price. As shown by results of a choice-based-conjoint-analysis, the most important factor for a purchase decision in the project sample is driving range, while driving costs are the most relevant attribute in the comparison sample. Finally, considering theoretical and empirical implications, intervention strategies are designed to increase the likelihood of choosing an electric car. The presented approach offers promising potential to explain, predict and alter behavior.